Virgil van Dijk was outstanding as Liverpool defeated Burnley on Wednesday night, with his post-match statistics highlighting his dominance. The Reds had to dig deep at Turf Moor, coming from 1-0 down in the second half to secure a precious 3-1 victory thanks to goals from James Milner, Roberto Firmino and Xherdan Shaqiri. Jurgen Klopp‘s side keep responding to Man City‘s unstoppable form, with a winning mentality consistently on show this season. There were a number of good performers against Burnley, from the ever-impressive Alisson in goal to Naby Keita‘s best showing in a Liverpool shirt. 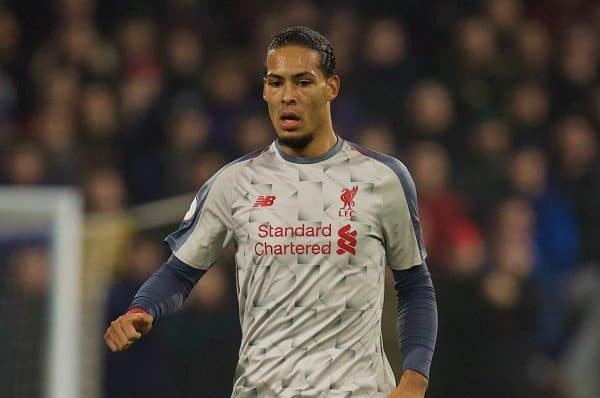 Again though it was Van Dijk whose influence was as important as anyone, with another all-conquering display at the heart of the Reds’ defence. By the time the final whistle arrived, Van Dijk’s post-match statistics summed up his night. The Dutchman enjoyed 118 touches, with 88 per cent of his 102 passes, the most in the team, finding a teammate – nine of which were successful long-range balls. He won a mammoth 12 out of 13 aerial duels up against the physical Burnley strike pairing of Ashley Barnes and Chris Wood, and made 10 clearances. Van Dijk even got an assist to his name, using his long legs to steer the ball into path of Firmino for Liverpool’s all-important second goal. On current form, no centre-back in the world is better than the 27-year-old, with his form up there with the best of any Reds defender in the Premier League era. He has been the club’s most important signing for a number of years, and for all the ability of so many current Liverpool players, he is the first name on Klopp’s team-sheet. The level Van Dijk has produced since signing back in January has been off the scale.